I vividly recall my first meeting with Colleen Patrick-Goudreau. It was 10 years ago, and I interviewed her for Satya magazine. We both live in the Bay Area, so we met for lunch at a vegan restaurant not far from her home in Oakland. What I remember most is how busy Colleen was: screening Meet Your Meat to passersby on a sidewalk in nearby Berkeley, giving talks, writing about animals, teaching vegan cooking classes, promotiong a DVD she had recently created, and working a “day” job. Soon after, she launched a popular podcast called “Food for Thought,” which is still going strong. She also started an animal activist support group, and she invited me to participate. About five or six of us would get together every few weeks at Colleen’s house, and we’d bare our collective anguish over what we were learning about animal exploitation. It was therapeutic and educational, and when I came to write Striking at the Roots a couple years later, I made sure to devote a chapter to activist burnout and how to avoid it. Fast forward a decade, and Colleen is now busier than ever. Gone is that day job, but she’s written a series of bestselling books, the latest of which is a completely new edition of The 30-Day Vegan Challenge, which she describes as “a one-stop, comprehensive guide to making the vegan transition healthfully, confidently, and deliciously with over 100 nutritious plant-based recipes and meal ideas.” This is a truly beautiful book, filled with resources, advice, and the encouragement new vegans need as they embrace this compassionate ethic. 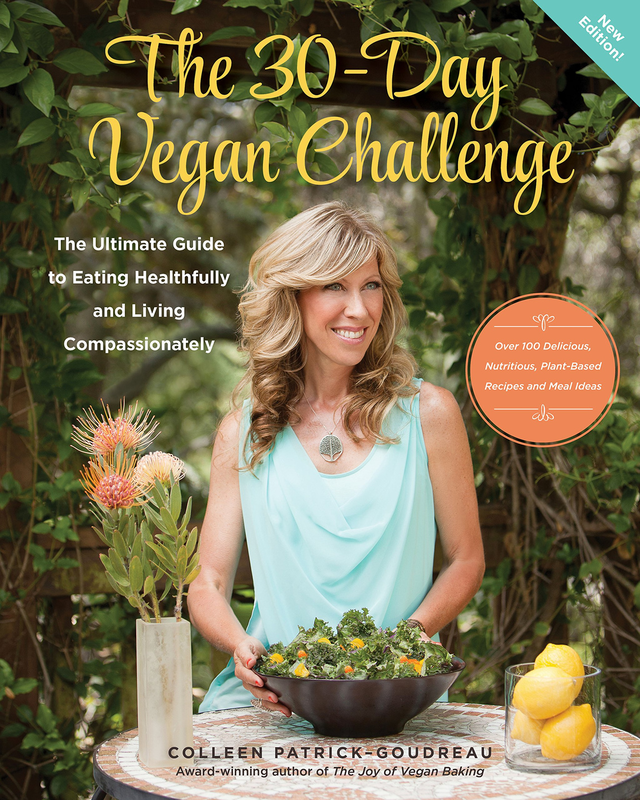 Being that this is January—a month in which many people around the world are taking veganism for a test drive—I thought this would be a great time to ask Colleen about her new book, her activism, avoiding burnout, and more. What forms of animal activism do you feel stand the best chance of getting our movement’s message across to people? I honestly think there is a need and room for all forms of activism. I do think that telling the stories of individual animals has a huge impact on public consciousness, and of course I think a lot of those stories can come from animal sanctuaries, which are really vital for saving lives of individual animals, but certainly sanctuaries is not the solution. They are just a stopgap. What we need to do is change systems, and that will happen in a number of ways: We need to change laws so animals are protected. We need to disrupt certain industries so that compassionate, cruelty-free products—food, personal care, clothing, medication, etc.—are widely available to the public or so that vivisection is no longer the norm. We need to close down animal-based circuses and zoos. We need to protect habitat for wild animals. We need to mainstream veganism and compassion. So I think there are so many different ways to go about it and I think activists themselves will be the most effective when they’re doing things they are good at and enjoy. What’s your favorite recipe for showing a die-hard meat-eater how delicious and satisfying a plant-based diet can be? OK, so you write, you teach, you have a podcast, you give talks, you have a vegan tour of Italy later this year—and more. Do you have a favorite way of sharing the vegan message? I really enjoy all the mediums I work in, but I guess I would say I really love talking to people directly, so I do love the public lectures so much. I love the Q&A that follows the talks, I love the interaction with people, and I love moving people just through simple, compassionate dialogue. Would you say that someone who is already vegan can also get something out of The 30-Day Vegan Challenge? Absolutely! The amount of information in this book makes it a resource guide for everyone who’s already vegan or becoming vegan. I could just change the title and the chapter titles, and it’s THE ULTIMATE RESOURCE GUIDE FOR BEING A HEALTHY JOYFUL VEGAN. That’s really what it is. It’s also got more than 40 wonderful, brand-new recipes that don’t exist in any of my other books. And as far as vegans using it as an advocacy tool, it really is the book every vegan can give to anyone who asks any of the questions we get about being vegan. You are so incredibly busy. What do you do to keep from getting burned out? I think it’s so important to be part of a community for a number of reasons, and one of those reasons is that we keep each other in check and we create reasonable barometers for each other because it’s really easy to work so hard or do so much that we are not taking care of ourselves. And even though it’s cliché, the truth is we are less effective when we’re working in such a state that depletes us rather than feeds us. I know that I need people who love me to say, “You need to stop now; you need to go for a walk,” because I don’t know what’s reasonable. I suffer from the guilt that so many activists suffer from: that if I stop, I’m letting down the animals. But the truth is I do feel refreshed when I step away and do something that revives me. As far as staying hopeful, I believe that what we focus on is what we create and I choose to dwell in the hope that I do see all around me, in advances taking place, in people making changes. That’s what I choose to dwell on. At any given moment we can choose to dwell on the hope or we can choose to dwell on the despair, and not only are we going to feel one or the other, but I believe that’s also what we will put out into the world. So we have to be gentle with ourselves and sometimes not expose ourselves to the things that make us sad or angry. Sometimes we need to have some cognitive dissonance and sometimes we just need to have a good cry. So I think between those things (community, dwelling on hope/being part of the solution, being gentle with ourselves, having a good cry when we feel it) is how I avoid getting burned out. Plus, I just have faith in the power of compassion and the good that is in people. Can you give us a hint about your future plans? Any more books or other media coming? I’m so committed to getting The 30-Day Vegan Challenge in as many hands as possible, so right now I’m really focused on making it mainstream. The entire package—the 30-Day Vegan Challenge as a concept—is very powerful and effective, and I really want to give it the attention it deserves. There’s the online program, and now there’s the new book. I’d love to record it as an audio book, I’d love to make it available to people all around the world in different languages, etc. But I also know that I really want to do television or rather short-form videos. I have a few television shows that I’m working on, so that’s really next in terms of big projects: one of them involves animals and one of them involves guiding people to becoming vegan. Both of these shows will enable me to inspire people and interact with animals. Doesn’t get better than that.